I have been camping a few times in my life. I have camped in the back yard, I have camped in the forest, I have camped in the woods (which is quite different then the forest) and I have camped in professional camping areas (camp grounds, with electricity hook ups and bathrooms with toilets). I have camped. I have slept in tents, RVs, just the sleeping bag, outside under the stars, with tons of people in one tent and with just me in a tent. 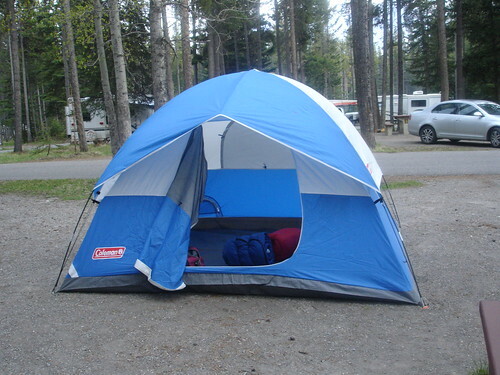 As a kid, my cousin and I would drag almost all of his toys out to the backyard tent and try to sleep with the G.I. Joes doing battle all around us. Sleeping in a tent is fun for a night, maybe even a couple of nights. But soon you begin to feel awkward and dirty. Usually you get sweaty and gross because you can't sleep past sun up. Then there is the fact that you have to keep the rain cover on because you don't want to be caught with out it. I like camping in a tent. I don't love it. My wife thinks it's the greatest thing since hammocks. But, that is another blog for another day. Now we know that if the earthly tent we live in is destroyed, we have a building from God, an eternal house in heaven, not built by human hands. Meanwhile we groan, longing to be clothed with our heavenly dwelling, because when we are clothed, we will not be found naked. For while we are in this tent, we groan and are burdened, because we do not wish to be unclothed but to be clothed with our heavenly dwelling, so that what is mortal may be swallowed up by life. Now it is God who has made us for this very purpose and has given us the Spirit as a deposit, guaranteeing what is to come. The Tent therefore is not a permanent thing. It is not designed for permanency. However, as Paul is so eloquent in pointing out, there are things that are permanent. Our bodies are made for the Lord and so therefore we must glorify God with our bodies. Yeah, that means me the fat kid needs to pay attention to what I eat. I need to exercise, all of that. But more importantly I need to fill my mind and my heart with the Word of God. With the teachings of Jesus. To have a more abundant life, I need only to spend time with Jesus. okay so i'm posting a comment. i have way too many books to read already but i will keep your pile in mind. i really enjoyed your tent revelation today. i love camping too and i haven't been in awhile but we're going as egnf group in october...in new england..we must be crazy..plus i'll be at least 5 months pregnant then so i must be even crazier. but to think and compare our earthly dwelling to a tent in comparison to our heavenly dwelling is inspiring. especially with all of your descriptive terms of camping, it really gave me a visual of how amazing heaven will be if our earthly dwelling is just a tent. thanks for your honesty. and i agree with kim that camping is the next best thing to hammocks. i've been LOST without you, ha ha. i really enjoyed reading about the tent. thanks for sharing. thanks for being a part of my life. i'm happy to have lived life with you and kim. maybe someday we will meet again.